Rick and Morty has been such a great show the past few years with their offbeat brand of humor and great storytelling. It’s a unique show that has plenty of depth to it and it isn’t afraid to change things up. 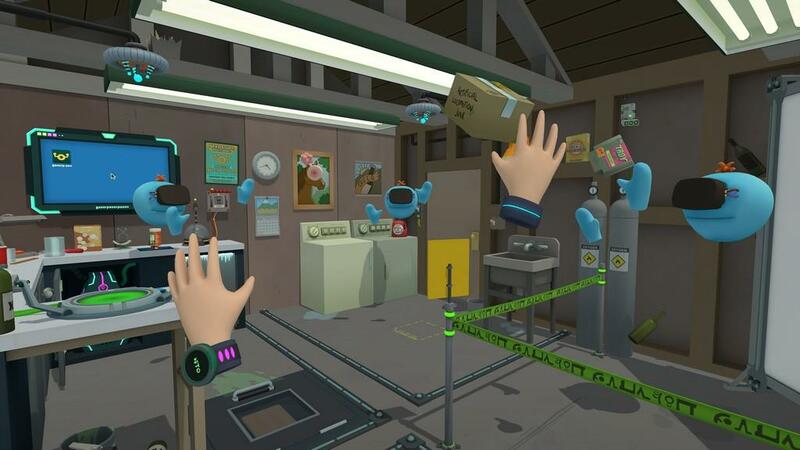 The folks behind the show have teamed up with the developers of Job Simulator to create a VR game that fans of the show will really enjoy, even though it’s a very short experience. 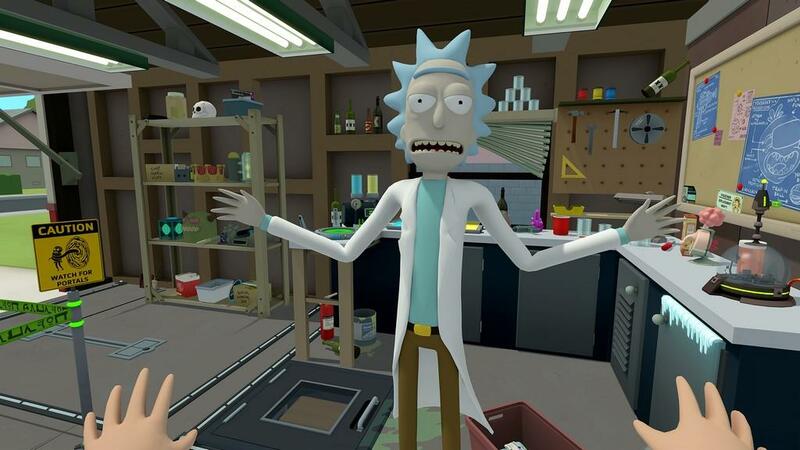 Rick and Morty: Virtual Rick-Ality puts you in the shoes of a Morty clone, even though you stand taller than Morty by a lot. Rick has created you to do some menial tasks and you get to live out some time in Rick’s garage taking part in their zany antics. If you’ve watched the show, you know there’s usually an ulterior motive for Rick’s actions and you can bet there’s probably going to be one here too for your existence. The first time I loaded up the game and I saw Rick and Morty standing right in front of me, I was so giddy. This great smile came across my face being able to actually stand in Rick’s garage and see the two title characters staring back and talking about me. You could not do this with a monitor as being virtually inside one of my favorite TV shows was an incredible thrill for me. Unlike Job Simulator where you pretty much have a single spot to work in, you’re given three areas in the garage to teleport to and there are opportunities to some minor room scale walking. These quadrants, or Jan Quadrant Vincents as I call them with the fourth quadrant being taken up by whiteboard giving you instructions, offer up different activities and machines to interact with. You’ll need to teleport between the quadrants to solve the various puzzles presented in the game. Like Job Simulator, you’re given some tasks to do before moving on to the next one and there are nine scenarios to play through. The puzzles aren’t terribly hard, but many of them have that decided Rick and Morty flavor and fans of the show will recognize a lot of what you’re asked to do and a lot of what objects are available for you to use. The puzzles take good advantage of your motion controls as well as the limited room scale option. One example is recharging a battery using the miniature universe as seen in the episode The Ricks Must Be Crazy from season 2. Pulling a lever will transport you to inside the display on the desk containing the min-verse. While the inhabitants of that world must step on gooble boxes to generate electricity, you have to pull some levers, turn some dials, or press some buttons to recharge the battery. Yeah, you become a combination of the various aliens in the multiple universes inside the battery. Since you are limited to the areas you can move around in, Rick has created a helper called a Youseek. They are like Meeseeks except they mimic your exact movements instead of doing something on their own to help you out. You’ll need to use them a few times to get some tasks done, of course, but it was really nice to see the folks at Owlchemy incorporate one of the more memorable characters in the series in a fun and unique way. A few of the areas in the lab can transform to something else or transport you to some place else. I mentioned earlier about transporting yourself inside the container of a miniature universe. The area behind the washer and dryer reveals a Roy video game that was in episode 2 of the second season. It’s not a full Roy game, but a very simplistic knock-off. While you can’t use Rick’s portal gun, he does give you a machine that opens up a portal to a few places that you can step into and visit. The “star” of the lab has to be the combinator. Here you put two objects, press a button, and they combine into something that takes the properties of the two. The results can be simple like putting an apple and a can having it spit out a metallic apple. Other times, the results can be hilarious, which I’ll leave you, the readers, to find out. Suffice to say, the combinator offers up a good deal of fun and funny sight gags. Owlchemy Labs is known to put in many Easter Eggs and there are plenty here to find. From the various cassette tapes that are littered throughout the game to some things you can create with the combinator as well as magazines and items found throughout the game, there’ll be plenty of things to find that will make you laugh if you’re a fan the show. Throughout the various scenarios, you’ll see and hear a few of the great characters from the show such as Mr. Poopybutthole, Summer, and Jerry. Most of your interactions will be with the two main characters of the show, but seeing and hearing the others were a nice experience. Graphically, Rick and Morty does a tremendous job at convening the style of the show in a 3D world. 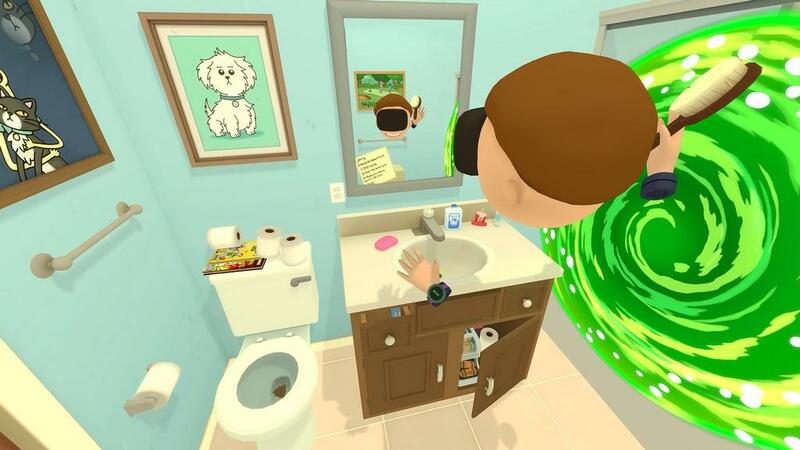 It’s a cross between Job Simulator and the cartoon so while it doesn’t look exactly like how the show is drawn, you definitely see its style in a virtual world. All the characters look and act just like they do on TV and the garage is an incredible recreation of the one on the show. 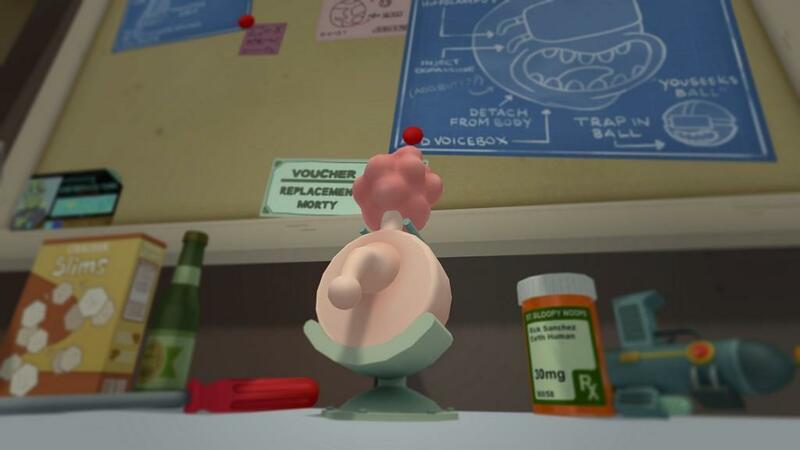 You’ll definitely recognize some of the more memorable objects such as the plumbus and the mega seeds. 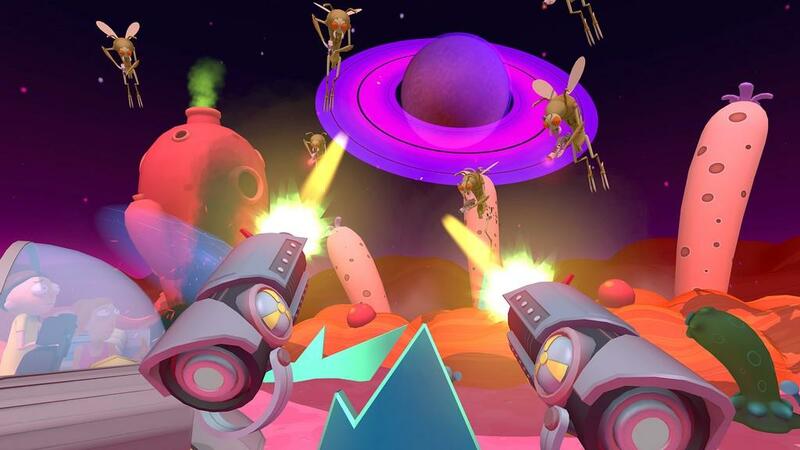 With the HTC Vive on, you’ll really feel like you’re right in the middle of the show, which is an impressive feat. While the game is fun to play and you have some great references to the show, it is really, really short. And that’s what’s going to give pause to those thinking of picking it up. At $30, it’s one of the more expensive VR games, but like I said, it’s also one of the shortest. There’s some replay value to the game besides discovering more Easter Eggs and participating in a shooting gallery type game, but the main story can be finished in less than two hours. It took me about 86 minutes and that’s from being stuck for a few moment on some tasks. Besides being really short, the game, of course, is really for fans of the show. If you don’t enjoy the show or never saw it, you’ll definitely be lost on most of the jokes and you just want get the fullest enjoyment out of the game. 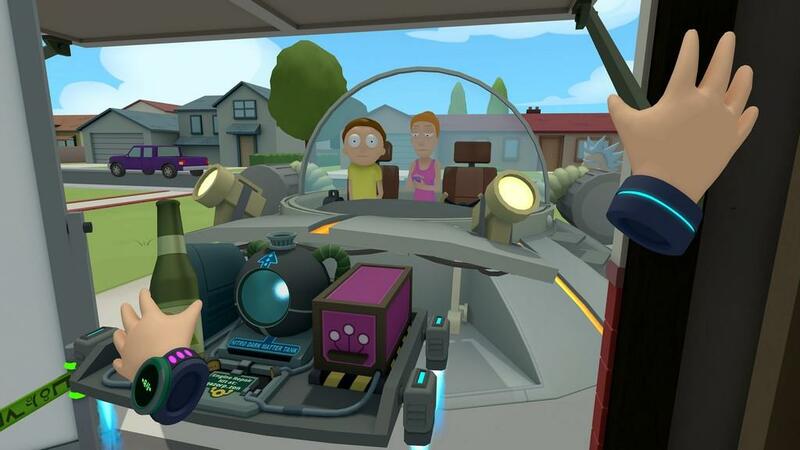 In the end, Rick and Morty: Virtual Rick-Ality has a lot of fun for fans. The VR aspect really brings you into the world of the show and I really enjoyed my time playing the game. I just wish it was a bit longer for the price, but this is one of the few licensed games of a TV show or movie that captures a lot of the magic from the source material.